Mobile phone which is now becoming a compulsory part to live a life. Since from fifteen to twenty years cellphones are providing best medium for instant communication. By keeping this aim cellphones are becoming more and more advance and transformed into smartphones having versatile functions. Today a situation is that for communication your friends or relatives either by call or message, for entertainment, and even for business we rely on smartphones. Currently the latest type and trend of smartphones was in touch screen. But now it seems its going to be change because, a latest technology known as CommBadge is introduced. CommBadge is a wearable Bluetooth speaker, which works with iOS and Android applications. With the help of it you can receive calls and can also operate your smartphone. It works same like Siri and Google Now or similar to Speech Recognition in computer windows, by which you can control your computer using your voice. After Clipping CommBadge with your dress you can compose emails or messages by dictation, can also use it for communications, can fix time for appointments, etc. CommBadge size is only 1.5 in Diameter and upto 1 gram in weight. With a less power Bluetooth 4.0 (or Smart) chip a connectivity is provided to it. 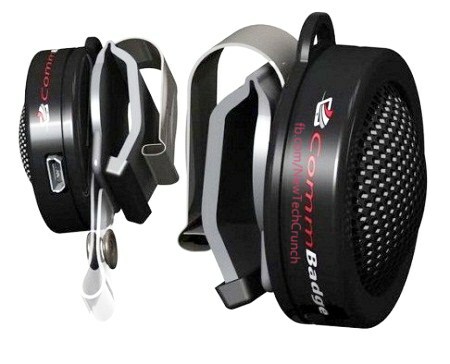 A noise cancellation system is used to mute background noises and make possible a clear voice transmission. It works fine in range of upto 100 feets, but in case of loss of connection it warns user early about it. Once its battery charged fully it can give you a one day full use before need of next charging. According to inventor of star trek Commbadge bluetooth Charles Krimstock said that for a large scale production currently we are collecting funds, but if you want to become its one of 1st customers you can register yourself in list and can take it in price of $75 USD. It would be available in White, Chrome and, in Black color. That is perfect for my Samsung Galaxy S3. I will check the Amazon store to see on what vendors carry them. Are there color variants for this?